The Nigeria Hydrological Services Agency (NHSA), has put the country’s loss to the 2012 flood disaster at N2.29 trillion. The agency which said this in its 2016 flood outlook also said that over 520 million people across the world suffer from severe flood yearly. It also said that, the number of people vulnerable to devastating flood is expected to rise especially with the increase in population, growth in flood prone areas, deforestation climate change, rising sea level and large scale urbanisation. The report also said that the international community has committed itself to finding new approaches to managing flood risk and addressing vulnerability, which includes prevention, mitigation, preparedness, response and recovery. “It also aims at promoting the concept of integrated flood management by emphasizing the benefits that can be derived from flood water while reducing flood losses”. 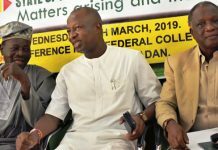 The report said that the Nigeria Hydrological Services Agency in its bid to key into the international best practices is sensitizing the general public, especially areas, on probable flooding events and advising them to take proactive steps to avoid lose of lives and property, damage to crucial infrastructure, disruption of socio-economic activities and in some cases, displacement of people in the affected areas. The Agency in the report also stressed the need for disaster risk managers, earth observers, decision/policy makers and their stakeholders to use the information to promote preparedness and embark on flood prevention and mitigation measures for better planning towards managing flood beneficially in a changing environment for sustainable socio-economic development. According to the agency, “the negative impact of flood can be reduced by promoting better understanding of the flood risks and ensuring appropriate measures in a holistic manner. “This can be done by proper channelization of drainages, construction of drainage network, routing of river courses, construction of artificial lakes, clearing of natural waterways, blockages and non structural measures such as sensitization and flood vulnerability mapping”, it said.